A MAGNITUDE 5.9 earthquake shook some parts of the Visayas and Mindanao Friday evening, with the epicenter located 28 kilometers southeast of General Luna in Surigao del Norte. The Philippine Institute of Volcanology and Seismology (Phivolcs) said in an advisory that the quake, which struck at 7:55 p.m. Friday, had a depth of 19 kilometers. It was tectonic in origin, added Phivolcs. Intensity 5 was felt in Surigao City, while Instrumental Intensity 4 was felt in Gingoog City. 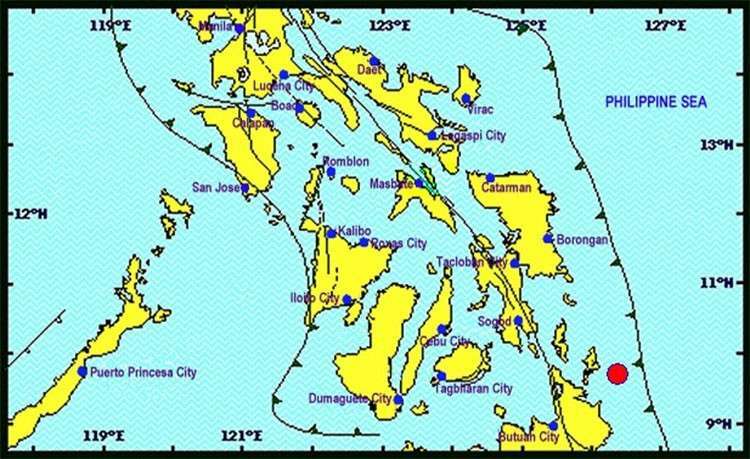 The quake was also felt at Instrumental Intensity 3 in Cagayan de Oro City, Borongan City, and Cebu City; Instrumental Intensity 2 in Catbalogan City; Instrumental Intensity 1 in Kidapawan City, Lapu-Lapu City, Argao City, and Alabel in Sarangani.